OsO2 does not dissolve in water, but is attacked by dilute hydrochloric acid. The crystals have rutile structure. 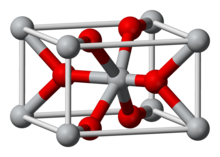 Unlike osmium tetroxide, OsO2 is not toxic. ^ A. F. Holleman & E. Wiberg (2001). Inorganic chemistry. Academic Press. p. 1465. ISBN 0-12-352651-5. ^ Thiele G.; Woditsch P. (1969). "Neutronenbeugungsuntersuchungen am Osmium(IV)-oxid". Journal of the Less Common Metals. 17 (4): 459. doi:10.1016/0022-5088(69)90074-5. ^ Rogers, D. B.; Butler, S. R.; Shannon, R. D. (1972). "Single Crystals of Transition-Metal Dioxides". Inorganic Syntheses. XIV: 135–145. doi:10.1002/9780470132449.ch27. ^ J. E. Greedan; D. B. Willson; T. E. Haas (1968). "Metallic nature of osmium dioxide". Inorg. Chem. 7 (11): 2461–2463. doi:10.1021/ic50069a059. 2 single crystals". Journal of Crystal Growth. 262 (1–4): 271. doi:10.1016/j.jcrysgro.2003.10.021. ^ Boman C.E. ; Danielsen, Jacob; Haaland, Arne; Jerslev, Bodil; Schäffer, Claus Erik; Sunde, Erling; Sørensen, Nils Andreas (1970). "Precision Determination of the Crystal Structure of Osmium Dioxide". Acta Chemica Scandinavica. 24: 123–128. doi:10.3891/acta.chem.scand.24-0123. This page was last edited on 18 April 2019, at 05:06 (UTC).